Sparkle, a manufacturer of graphics cards and PC hardware cooling solutions will today be showcasing tree new products at the Computex convention today jthat consists of a new D-cYclone cooling solution, and two new graphics cards namely the GTX 680 and GTX 670 Calibre Graphics cards. This time, the Calibre editions will be packing a much more beefier cooler that looks straight off a copy of Gainward’s Phantom series cooling solutions with three fans encased inside the cooler and 6 heat pipes coming from the cooler GPU core and into the heatsink fins. The new design is supposed to output less noise and cools better at low rpm as well. For more details refer to the press release below. 2012 COMPUTEX will take place from 5th to 9th of June 2012. 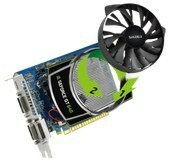 The world leading graphics card company Sparkle will introduce the latest technologies and products in COMPUTEX. Pay a visit at booth L1318 in 4th floor of TWTC Nangang Exhibition Hall, you will get the latest product update from Sparkle.